trading faces: What has law school done to the animals?! What has law school done to the animals?! I had half a turkey sandwich yesterday, and I’m having another today. Has law school made me forsake my vegetarian principles? Not so much…I lost those long ago, but just preferred my way of eating. Law school has stressed me into not cooking. Rather than cook each day, I’ve been making casseroles and such, and freezing them into Gladware so as to have a large supply of lunches and dinners. Casseroles with cheese. Lots and lots of cheese. Do you people have any idea how difficult it is to pre-prepare healthy meals?! So, in lieu of getting fat on pre-prepared vegetarian fare, I am toying with expanding my diet to include poultry. It’s easy and convenient to have lean sliced turkey and chicken on some whole wheat bread, and probably healthier than consuming ten pounds of beans and cheese each day. Commence with your gloating all you carnivores who have smirked at my soy products. I have a memo to finish. 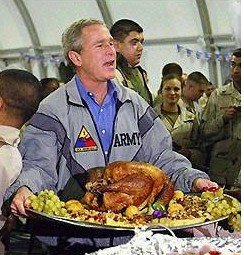 FYI, the turkey on the plate is fake, but I still prefer it to the turkey holding it. Melt Cheese Whiz, mushroom soup and butter in a sauce pan over low heat. Add cooked, drained broccoli, drained mushrooms, chopped onion and Minute Rice. Bake in a small casserole at 350 degrees for 20 to 25 minutes. Serves 4 to 6. Sweetie, that sounds delish (really, is there anything good not made better with cream of mushroom soup? ), but I'm trying to get away from the cheese and the cheese food! lol! hello christopher, perhaps you know of me from ces' blog. since i am a secret visitor to your blog, and since often i laugh outloud from you witticisms and relatives , and since we would probably like eachother anyway, and since we probably hang out in parallel circles,i thought it might be time to say hello and wish you well. so that's what i'm doing.that's all. Christopher meet kj; kj meet Christopher. I am very fond of you both. Christopher - at least you cook. I havent' cooked, oh yes I have cooked, something is amiss over here, I have not set a table in ages - what is wrong with that picture? That turkey is the dumbest bird on earth. Did you hear about my son, Doogie Houser, MD? He came out of the closet. I’m so proud of him. I hope everything in your life is going well. Alright, let's hear it for processed cheese!!!!! No nutritional value whatsoever! Christopher, I tagged you for a meme so please be a good sport and check out my post for today. Thanks. No, Mr. President, NOW you got a thumpin'!